While many of us are back at school, it seems perfect right now to review something old school. See what we did there!? 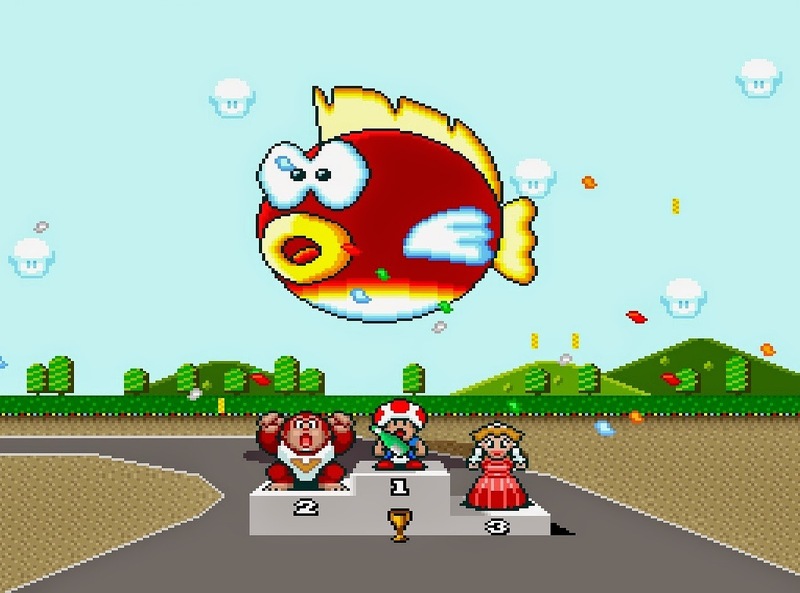 Anyhow, Super Mario Kart released last month in North America on the Wii U Virtual Console service. We took that opportunity to let Phil out of his cage temporarily to write a review for it! All right. Back in the cage, you! An Italian plumber and friends in go-karts? Yeah... that'll never work. Such a statement could be said without anyone questioning you. Nowadays, kart racers starring mascots aren't bizarre at all. In fact, many have gone on to be commercial and critic darlings. The one game that can definitely take credit for that is Super Mario Kart. Beforehand we had never seen the likes of a game that put mascots behind the wheels of small go-karts. Now, it's commonplace with titles like Diddy Kong Racing, Crash Team Racing, and Sonic & All-Stars Racing Transformed, for starters. Does Super Mario Kart still play well enough to ride with the big boys, or does the game now suffer from a flat tire? bottom half of the screen. Big help! ...No, really! 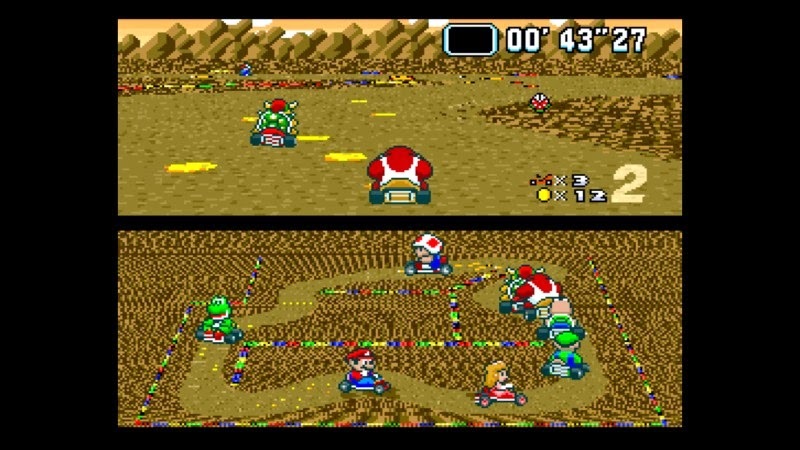 Super Mario Kart consists of four cups of five circuits each. The first three cups are available in all three speed classes (i.e. difficulties) of the game, the Mushroom Cup, the Flower Cup, and the Star Cup. The fourth, the Special Cup, is only available in the 100cc and 150cc speed classes, and it unlocks when the previous three cups have been completed successfully. The races are five laps each, and some laps can be as quick as 15 seconds, so the length of races is pretty much perfect. Races don't drag on too long, and you feel like you've gotten a fair share of a given track once you've completed it. A given cup can last upwards of 15-20 minutes, maybe even less if you're really smoking. 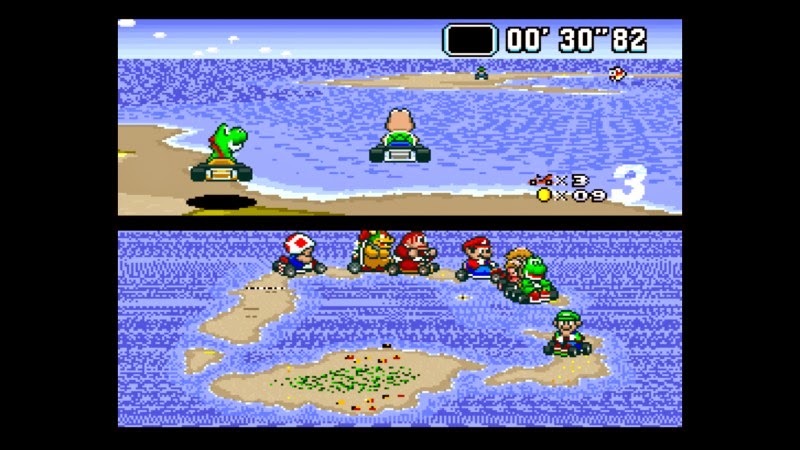 Races span across several locales like the beginner-friendly courses of Mario Circuit, the sharp corners that line the curves of the lava-filled Bowser's Castle, and the sunshiny beach and sea driving of Koopa Beach. Nearly every locale has multiple races on it, such as Donut Plains, which has Donut Plains 1, Donut Plains 2, and Donut Plains 3, for instance. 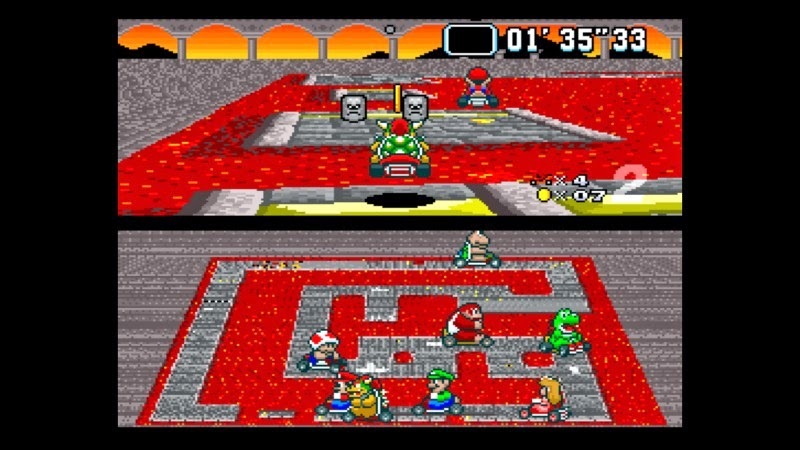 Mario's first racing outing in Super Mario Kart sports extensive use of Mode 7, a graphical trick creating an brilliant illusion of 3D. Just don't expect any rolling hills or height changes on the courses-- these tracks are as flat as Channing Tatum's rock hard abs. (Someone reading this review just started to sweat, I can bet you that.) That's not to say they're lacking personality either. The Ghost Valley tracks have deteriorating railing that falls apart when a racer bumps into it, while tracks like Choco Island contains chocolate goo that results in your kart sliding across its surface, making precision-based turning next to impossible. Darn, and I was on a diet, too! 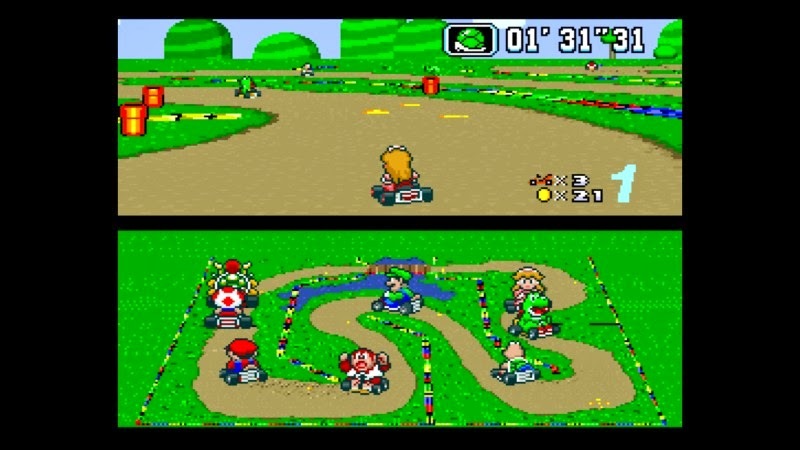 Super Mario Kart allows for one to two players to race in the Grand Prix mode, the main mode of the game. In the solo Grand Prix, you need to at least come in fourth place to move onto the next race. Doing any worse not only means you must redo the race, but you lose what I will call for a lack of a better term, a life. Lose all your lives and it's game over. In two player Grand Prix cups, all that is necessary is for one player to do at least as well as fourth place. Just realize that you only get one point for fourth place while first nets you nine. As expected, the racer with the most points at the end of a cup wins first place overall, and this is what you definitely want to achieve. Kart, the real fun truly begins! Racing in Grand Prix cups is overall a good time. The AI isn't overly smart, but at the same time they use some cheap tricks to artificially make the Grand Prix harder than it needs to be. Each character possesses their own trademark item which they use routinely in races, especially if they're riding close to your tail. Mario and Luigi turn on some superstar power, becoming completely invincible, Peach and Toad toss little mushrooms that temporarily shrink those who are foolhardy enough to run into them, and Donkey Kong Jr. chucks banana peels onto the track to slip up unknowing racers. The AI also constantly leaps over items you place on the track unless they are put around corners and turns, so good luck ever getting a computer player to run over one of your banana peels. 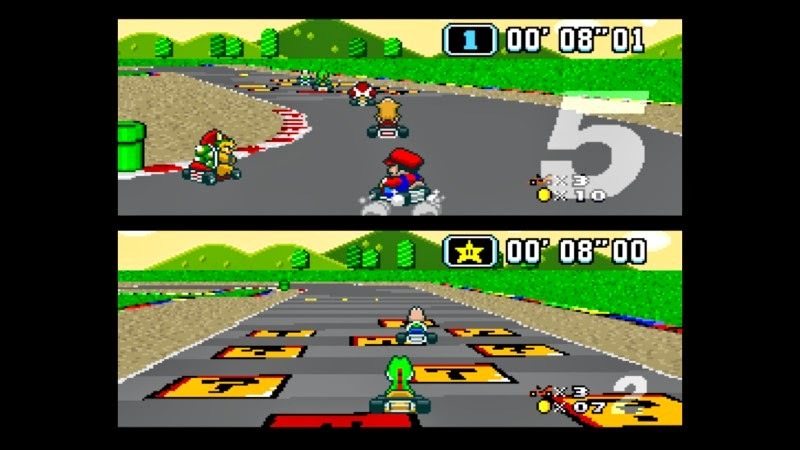 Outside of Grand Prix, there are two other modes to tackle in Super Mario Kart, ones that have become mainstays for the series. Time Trial puts you against one opponent and only one opponent, the clock, as you race five laps on a chosen course to try to set a new time record on it. The other is the incredible Battle Mode, which puts two human players in one of four arenas, shooting off items, playing offensively and defensively, to see who can eliminate all three balloons from the other player first. A lot of items used in future installments of Mario Kart as well as those inspired by the series find that roots in Super Mario Kart. From green shells that ricochet off walls to lightning bolts that shrink and slow down all players in a race, the items are well balanced for human consumption. More defensive items like the Feather and Mushroom offer the ability for players to take advantage of them, opening up shortcuts that would otherwise be inaccessible and/or worthless without them. without proper cornering skills feel the burn! Super Mario Kart is still a great deal of fun today, and one of the main reasons for that is just how tight the controls feel. Turning isn't too loose or too stiff, the sense of speed is there, and making either close or wide turns is very easy to do. One can even hop with the shoulder button to pass over small chasms and make strategic hops for their betterment. 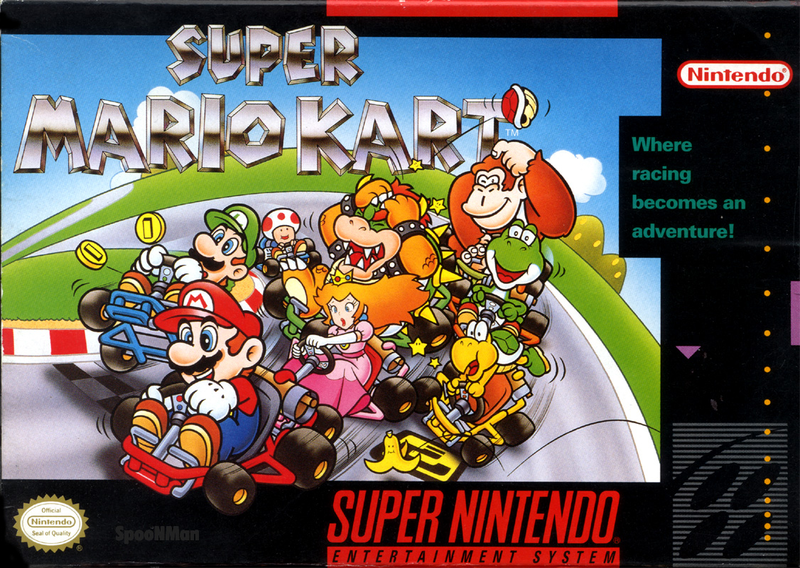 All in all, Super Mario Kart retains its relevance as an enjoyable kart racer even now because of how well Mario, Luigi, Peach, and the gang control. The real entertaining factor of Super Mario Kart goes away if you're lacking someone nearby to play it with. Sure, you can always tackle your best records in the Time Trial portion of the game, but there's nothing like competing against a friend for some competitive play on the couch. Playing the game alone takes away a third of the modes available to you, and replaying the Grand Prix even after it has been completed gets rather old unless you have a friend or family member there to mix things up. Still, Super Mario Kart remains a terrific choice for those wanting a whimsical kart racer and don't mind not having the upgrades and complexity of more modern games in both the Mario Kart series and kart racers in general.